One of the best treats in life is to be able to learn from the challenges of others. For private companies implementing Topic 606, Revenue from Contracts with Customers, 2018 is providing just this opportunity. Most public business entities (PBEs) adopted Topic 606 on January 1, 2018. This represented the culmination of, for many PBEs, a multi-year effort to successfully implement this far-reaching new standard. As most private companies will not be adopting Topic 606 until January 1, 2019, or beyond, they will have an excellent opportunity to benefit from the efforts of PBEs. While their operations are generally not as complex as PBEs, nor do they have the SEC and SOX reporting requirements of PBEs, private companies have to follow essentially the same accounting guidance as PBEs as they adopt Topic 606. Over and above just getting the accounting correct, PBE adoption of Topic 606 has identified several potential pitfalls which private companies should address in order to make their implementation project go as smoothly as possible. The implementation of Topic 606 will inevitably change a company’s business processes, and with that, its internal controls. While private companies do not need to report on the effectiveness of their internal controls, they nonetheless should maintain well documented and effective internal controls over their revenue recognition process. This is particularly important when it comes to the many subjective decisions which Topic 606 requires. It is best to begin this documentation in real time with the redesign of business processes and to consider the necessary internal controls as the new business processes are being developed. As business processes change, companies will need to assess the adequacy of their financial systems, both to assure that they can accommodate the changes necessary to effectively adopt Topic 606 and to assess potential upgrades that can enhance efficiency or automate manual processes. Many company activities revolve around the accurate recording of revenue. For companies which see a significant impact from adopting Topic 606, such critical activities as budgeting, compensation, governance and legal analysis will be impacted by the adoption of Topic 606. From updating budgeting templates to contemplating the impact on debt covenant compliance, many companies will need to update these and other functions. 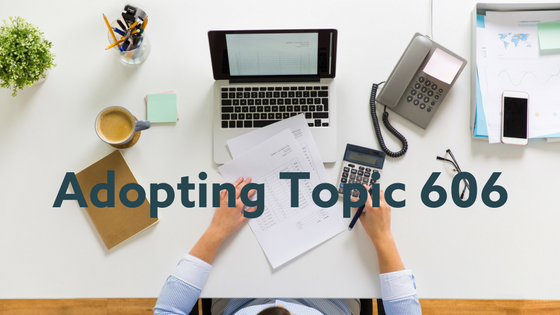 Now is the time to consider all the implications associated with adopting Topic 606 so your company is ready to go on January 1, 2019. Any change in the timing of revenue recognition is likely to have an impact on a company’s computation of its deferred taxes. These impacts should be considered from both the federal as well as the state perspective. Additionally, companies need to consider the new guidance in the Tax Cuts and Jobs Act with regard to conformity of revenue recognition practices for both book and tax. It is important to get the right tax personnel involved in these assessments as early as practicable. While the disclosure requirements for private companies are significantly less onerous than for PBEs, private companies will most likely need to significantly increase their disclosures related to revenue. Published PBE financial statements can serve as a good model for many private companies, which can see how similar PBEs complied with these new disclosure requirements and may want to “borrow” some best practices. These are only some of the many considerations which private companies must address as they implement Topic 606. The experiences of PBEs as they went through the process will provide great insights on best practices and other practical information on how these companies can effectively adopt this new standard. This is a great opportunity to learn from PBEs’s experiences. In Surgent’s upcoming webinar, Guide to the New Revenue Recognition Model for All CPAs, we’ll cover the core Topic 606 model as well as these implementation issues and more. The webinar runs on Thursday, July 19th, 2018, from 1:00 – 4:30 PM.